We had a customer come into the shop today and tell me that he wanted the bike from Crybaby. We pulled up some pictures online and talked about what he liked about it. He decided that it would be too complicated and he would rather buy a Nightster. There is something for everyone. 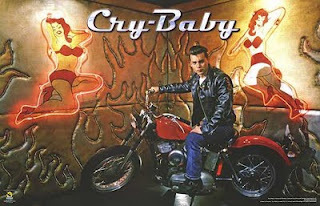 The last time that I saw Crybaby was hung over on a Sunday. I think that it was on TBS. This whole thing made me realize that I haven't been lay on a couch Sunday hungover in years.